To permit improved understanding of the massively complex innate immune (inflammatory) network and to understand the basis for activity of our immunomodulatory peptides, the Hancock Lab with its collaborators have developed, validated and established highly powerful bioinformatics tools for understanding high throughput genomics datasets. Our major data source is RNA-Seq which we perform in house yielding a massive amount of transcriptomic data. 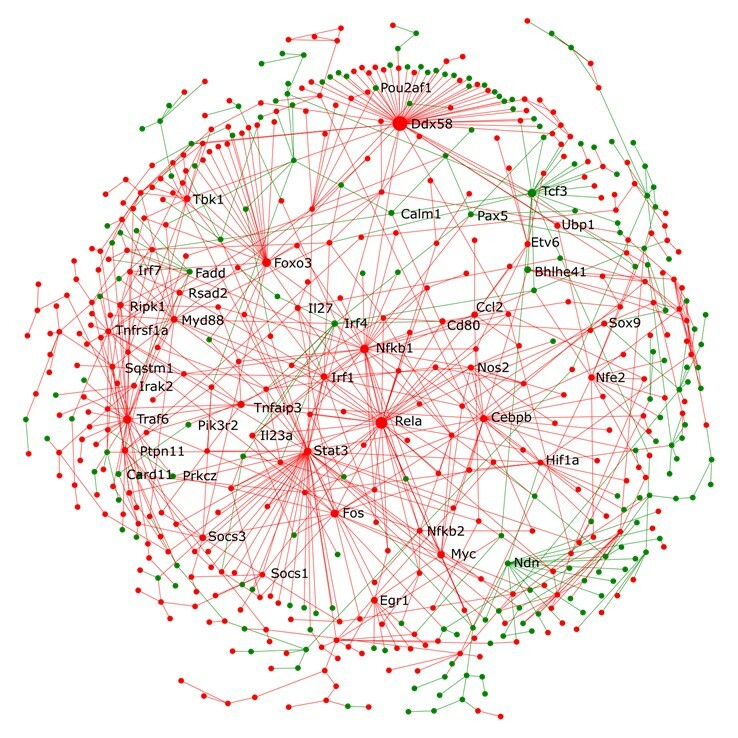 To interpret this data through mapping to protein:protein interaction networks, with funding from the Grand Challenges in Global Health Research Program, Genome Canada and Canadian Institutes for Health Research, we developed and validated large databases (InnateDB, NetworkAnalyst) with integrated, sophisticated analysis tools, made them freely available to other researchers as open-source tools, and applied them to generate advanced understanding of host responses to pathogens and inflammatory diseases (see Link for general strategies). InnateDB, is an open-source, publicly-available database and systems biology analysis platform of all the genes, proteins, experimentally validated molecular interactions, and pathways in the human, mouse and bovine innate immune responses. It has become an important tool in immunology with ~6 million hits per year, from ~12,000 distinct internet addresses. Our newest tool is the NetworkAnalyst platform recently published in Nature Protocols, and featuring statistical, visual and network-based approaches for meta-analysis and systems-level interpretation of transcriptomic, proteomic, and metabolomics data. By coupling the latest methods in network biology with cutting-edge visual analytics technologies, it delivers extremely fast network layout, hub analysis and visualization. It enables unbiased examination of large transcriptome datasets as networks based on known protein-protein interactions. Mining of the information for sub-networks, hubs and pathways permits unique insights into data including differences due to specific mutations, experimental conditions and stimuli. Interaction Network for host transcriptional responses in whole lungs from mice infected with Pseudomonas aeruginosa PA103 vs. control. Collectively these tools and strategies are enabling exciting new insights into infections and inflammatory diseases. For example, in cystic fibrosis, systems biology studies provided tremendous mechanistic insights into excessive inflammatory responses, and three novel approaches to therapy of hyperinflammatory lung disease in these patients whereas in sepsis use of these tools enabled us to identify a signature of cellular reprogramming/endotoxin tolerance, present in more than 600 diverse patients as early as the emergency ward, predicted the onset of severe sepsis and organ failure (p<0.001 to p<10-6; AUC 98%). We are also studying large datasets on (1) retinoic acid supplement in oral vaccine efficacy in man, (2) investigating the systems biology of infections, (3) mouse sepsis and treatment with BCG, (4) determining the basis for efficacy of vaccines in early life in the Neonatal Vaccination Project, (5) studying the systems biology of mycobacterial disease of cattle and using this to pursue reverse vaccinology approaches to make effective subunit vaccines, (6) studying the impact of rhinovirus on epithelial cells for individuals with cystic fibrosis, and (7) deciphering the basis of wound healing defects in asthma patients. In our hands bioinformatics using network biology approaches is an excellent method for deriving new hypotheses for subsequent lab testing. More recently we have been exploring how to integrate patient metadata with transcriptomic data enabling the correlation of particular metadata parameters (e.g., gender, clinical symptoms or test results, disease status, treatments, etc) with transcriptomics using as one of our major tools the open source R statistical computer language based FactomineR. We have performed this extensively for infants with the rare blood vessel inflammatory disease syndrome, vasculitis, (manuscript in preparation) and this has allowed us to classify patients with previously unclassified vasculitis (UCV in Fig. 1), but also to discriminate between two forms of small blood vessel inflammatory diseases that physicians struggle to differentiate, namely Microscopic Polyangitis (MPA) and Granulomatosis with Polyangitis (GPA). With the Wellcome Trust Sanger Institute, we are engaged in a large project to phenotype homozygous knockout mutants of mouse and human stems cells. In particular we are investigating (1) Chlamydia infections of human induced pluripotent stem cell derived macrophages and derived homozygous mutants, and (2) the influence of gene knockouts and immune stimuli on mouse embryonic stem cell derived macrophages.